Bright Beginners Academy Succeeds Where Many Child Care and Preschool Programs Can’t. Our staff has experience in supporting the typically developing child as well as children facing behavioral challenges including children with autism. When needed, our professional staff can perform a professional assessment for autism, develop a treatment as well as provide needed services. Classrooms are designed to allow for free development across the ages. Younger children benefit from the modeling of older children, and older children benefit by serving as role models and helpers to the younger children. Warwick Family Services and Maternal Child Consortium (MCC) support Bright Beginners: Located on premises, MCC provides therapeutic services to guide children and families through challenge and difficulty. MCC’s experts observed that extraordinary children weren’t getting support in daycare and preschool that prepared them for success. They designed and built Bright Beginners Academy to fill that need. We coordinate care: Our experience and services support your extraordinary child comprehensively. We understand your challenges and work hard to solve them: evaluating needs, finding help through public or private means and tailoring programs to fit your child’s needs. Our team supports the transition from preschool to kindergarten, too. 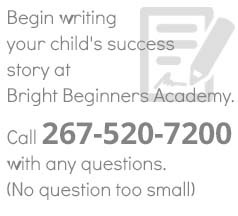 Write your child’s success story by enrolling him at Bright Beginners Academy today! Our mixed age and developmental model encourages independence, functional communication, compliance with direction and positive growth of social skills, coping skills and self-esteem. By utilizing an inclusive model, children of different developmental levels and needs can learn from each other. This carefully planned environment helps to further develop acceptance, compassion, kindness and understanding of everyone’s unique differences. Caring professionals from Warwick Family Services and Maternal Child Consortium (MCC) staff created Bright Beginners Academy to solve an urgent problem: many daycares and preschools don’t prepare extraordinary children to succeed in elementary school. Many special children start kindergarten with hope and energy, only to find teachers and administrators ill equipped to provide for their needs. Bright Beginners fills that gap. With our expert assistance, your extraordinary child starts school with all the services and skills he needs. With help now, he may even fit right into kindergarten as “one of the kids” with no additional assistance required! Call now and talk with our accomplished director and clinical advisor about preparing your extraordinary child to succeed!